Following quite a bit of shuffling Giovanni Cabrera-Mioletti now finally knows who he will be facing in the main event at Battle at the Boat 117. 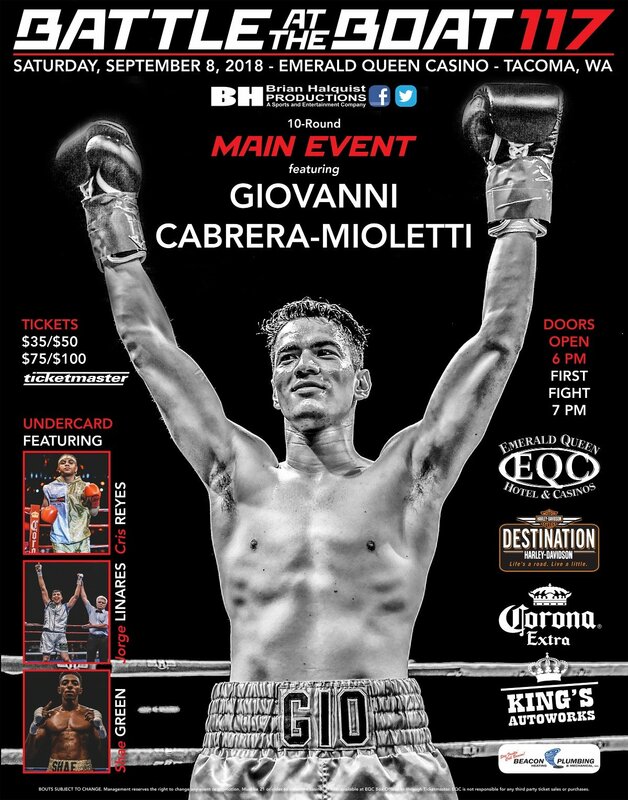 The undefeated Cabrera-Mioletti will go up against Carlos Padilla in a 10-round junior lightweight bout on Sept. 8 at the Emerald Queen Casino in Tacoma, Wash.
Cabrera-Mioletti brings a perfect 12-0 record with 3 KOs into the contest, while Padilla sports a 16-7-1 mark, winning 10 of his fights by knockout. Cabrera-Mioletti bested Pierce, who entered their fight with a spotless 8-0 record with 7 KOs, in his last fight on June 9, flooring Pierce for the first time in his career in the first round before going on to be named is the 97-92, 97-92, 100-90 winner of the judge’s scorecards. That win came after Cabrera-Mioletti defeated a then 11-0 Lampkin by second-round TKO. Padilla enters the bout with an impressive resume of his own. The 29-year-old Padilla fought Emanuel Lopez for the interim World Boxing Association world super featherweight title in 2015, entering the contest with a 15-1-1 record. Highlighting the undercard will be a 5-round bout in the 138-pound weight division between Linares (4-1) and Green (1-0-1). A second 5-round contest, this at 147 pounds, will be contested between Yakima’s Andres Reyes (7-3-1) and Portland, Oregon’s Sean “Beast of War” Gee (4-8). Undefeated 138-pounder Cris Reyes (3-0) will look to stay perfect when he faces Keith Wolf (0-1) in a 4-round clash. Rounding out the card will be a 142-pound matchup between Andres Garcia Albaca (debut) and Luis DeAlba (debut) and a 127-pound fight between Juan Gomez (1-0) and Marco Flores (1-1). Battle at the Boat 117 will feature the VIP experience with 3rd Row Seats being discounted to $75 per ticket. All fans seated in in the VIP section (rows 1-3) will have an exclusive access point and a dedicated server to help create a true VIP experience.